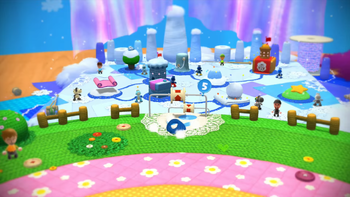 World 5 is the fifth world of Yoshi's Woolly World. It is a mostly ice-themed world, featuring elements related to snowballs and ice blocks. As in all other worlds, there are nine levels: eight compulsory, and one special level that is unlocked after all other Smiley Flowers in the previous levels in the world are collected. Completion of this world unlocks World 6. Fluffy Snow, Here We Go! A snow level with many snowballs and Flooffs. Frozen Solid and Chilled An ice cap level with many Spray Fish. Flying-Carpet Cruise A sky level that features flying carpets and Fluffy Phantoms. Big Montgomery's Ice Fort A fortress level where Big Montgomery is fought a third time. A Little Light Snowfall A snow level with Snow Guys and falling snow. Up Shuttlethread Pass A level that involves snaking platforms and many different paths. Snowy Mountain Lift Tour A snow/sky level where Yoshi must utilize many line-controlled platforms to advance. Snifberg the Unfeeling's Castle An ice castle level where Snifberg the Unfeeling is fought. Yoshi's Curtain Call A special level in which Yoshi must ride many fast-moving curtains. This page was last edited on October 12, 2017, at 05:26.